The Korean War Veterans Memorial honors all those who served in the Korean War, both the Americans and their allied partners. The memorial is one of many comprising the National Mall and Memorial Parks. It is located near the Lincoln Memorial just south of the Reflecting Pool at the west end of the National Mall in Washington, D.C.. The memorial includes a Wall of Remembrance and 19 stainless steel statues. The 164-foot long Wall of Remembrance is made from polished black granite. Over 2,500 archival photographs are etched into the wall, representing the troops who fought in the war via land, air, and sea. From afar, the arrangement of the faces of the soldiers gives the appearance of the mountain ranges of Korea. 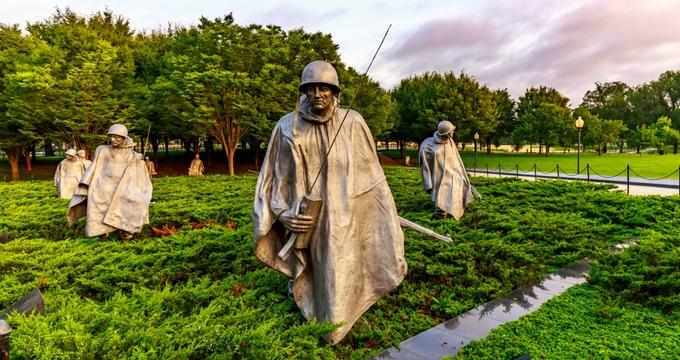 The reflective quality of the highly polished black granite gives the appearance of 38 statues, which represents the 38 months the war lasted, and the 38th parallel, the latitudinal line connecting Korea with the US. Adjacent to the wall are 19 stainless steel statues, only slightly larger than life sized, designed by the artist Frank Gaylord. The figures are dressed in full combat gear and patrol the area within the walled triangle of the memorial. The US Army, the Marines, the Navy, and the Air Force are all represented. The statues walk through a field of juniper branches and polished granite strips, representative of the rough terrain and rice paddy fields in Korea. A second lower wall, the United Nations Wall, honors the 22 member nations of the United Nations who contributed as allies of the United States during the Korean War. The large memorial wall intersects a reflecting pool, the Pool of Remembrance, also of polished black granite. This pool lists the numbers of soldiers missing in action, killed, wounded, or taken as prisoners of war. Visitors are encouraged to sit at the benches surrounding the pool and reflect on the human cost of war. “Freedom is Not Free” is the inscription inlaid in silver on an additional black granite wall. The memorial honors the 5.8 million Americans who served in the armed forces during the Korean War. Although the 3-year-long war is considered to have been relatively short in duration, over 36,000 Americans lost their lives. Among those, 8,200 are listed as missing in action or buried at sea. A visit to the memorial is free, and the National Mall and Memorial Park is open 24 hours daily. History: The design for the memorial was originally awarded in 1986 to a team of architects from Pennsylvania State University, but the team withdrew their submission when it became clear that too many changes would have to be made to suit the requirements of the government. Ultimately, the architectural firm of Cooper-Lecky oversaw a team of designers responsible for the final memorial. On Flag Day in 1993, then President George H.W. Bush broke ground for the memorial. It was President Bill Clinton, together with Republic of Korea President Kim Young Sam, who dedicated the completed memorial in 1995. In February of 2016, President Barak Obama signed a law authorizing the establishment of a Wall of Remembrance to be added to the outskirts of the Reflecting Pool, which would list the names of each soldier who was killed in the Korean War. Fundraising for that project is ongoing through the Korean War Veterans Memorial Foundation. Ongoing Programs and Education: Park rangers are available between the hours of 9:30am through 10:00pm each day to answer questions about the memorial and the National Mall. The park is host to several events and programs, including walks, talks, runs, and lectures. However, not all of these events are specific to, or meet at, the Korean War Veterans Memorial. Visitors who are interested in learning about this specific memorial may wish to schedule a private tour. Past and Future Exhibits: Recent programs at the park include a Meet and Greet with Veterans Moving Forward. Visitors may meet a service dog and learn about how service dogs assist disabled veterans in their daily lives. Ranger Runs meet on Saturdays and take visitors through the park at a 10-minute mile pace, stopping at several of the memorials for discussion. What’s Nearby: Visitors to the National Mall and Memorial Parks would be interested in seeing many of the nearby memorials, including those that make up the central channel of the National Mall, where the Korean War Veteran’s Memorial is located. These include the Lincoln Memorial, the World War II Memorial, Washington Monument, and the Vietnam Veteran’s Memorial. Back to: Things to Do in Washington, D.C.